Like many women who were teenagers in the ‘90s, I overplucked my eyebrows. I remember I was just shy of my sixteenth birthday when I first attacked them, after reading an article in Seventeen magazine about how best to shape a perfectly formed arch. There were instructions for how to achieve the proper angle, by using a pencil to indicate a line from your pupil to the midpoint of your brow, but I certainly wasn’t that methodical about it. I found a small pair of tweezers from a cheap Swiss army knife (seriously–my femme skills have always left a bit to be desired) and just started thinning everything out. Photos of my mother from when she was a teenager and in her early 20s likewise show her with…unrealistically shaped brows, shall we call them. And, I have to wonder, if she’d still been alive when I decided to take matters into my own hands, if she would have discouraged me from doing so. Or if she would have taken me to a salon where a professional might have been a bit more gentle with the approach toward reshaping them. Or if, y’know, she at least would have recommended I use a slightly nicer tool for the job. But, since I’d committed to the endeavor with my typical never-look-back, never-say-die attitude (I didn’t want to admit, even to myself, that I was terrified of looking like an idiot or that I didn’t know how to do something or even that I was completely in the dark about the so-called right way to be a girl), I just kept tweezing and tweezing and tweezing. Alone in my bedroom in the evening after school or on the weekend, I would stare into a mirror and compulsively try to straighten everything out, which of course usually only made matters worse. None of the older women in my life ever said anything to me about it. Maybe they didn’t notice? But, I kind of doubt it. I was simply left at sea about it, as I was in so many other areas of my life. Throughout my twenties, I always had the nagging thought in the back of my mind that I would need to have a professional help me fix my eyebrows, as best as could be managed after so many years of overplucking. My fear, though, always got the better of me whenever I would seriously think about going anywhere. 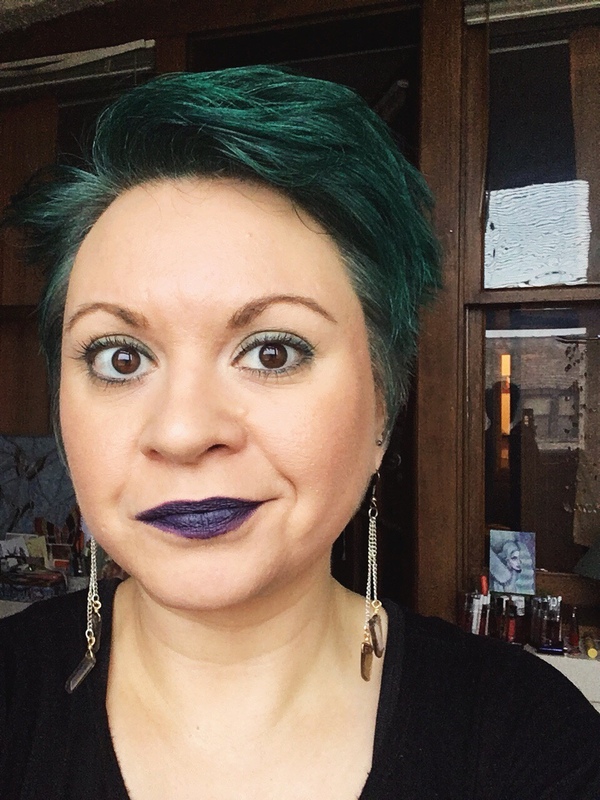 I rationalized that it would be too expensive or too painful, but I was really most afraid that I’d be laughed off the premises — for the unruly state of what was left of my natural brows or for the lamentable way that I’d maintained them, I’m not sure. I was equally afraid, though, that my oddly shaped brows were secretly earning looks of derision from fashion snobs and other beauty-conscious women that I knew or ran into on a regular basis. With something as unavoidably visible as one’s eyebrows, about the best I was able to do was draw them in a little more evenly with dark brown powder, but it wasn’t like I could exactly hide them (like one can do with most other undesirable flaws). I eventually got up enough courage to have my eyebrows threaded at the little “Perfect Eyebrows” salon in the Century Shopping Center at Clark & Diversey. (The first time I tried to go, I tell you the truth, I got so scared that I turned around before I even entered the shop and left the building altogether. Reader, I was 33.) The woman who runs the place is completely no-nonsense, and the Yelp page for the business is full of praise for her quick treatments and low prices. I’ve had nothing but wonderful experiences there, and though my hair grows so fast that I’m often left with bristling caterpillars on my face on the in-between weeks when I can’t make it for a treatment, my eyebrows do, in general, look a lot better than they used to. I’ve had to make peace with the fact that I’ve probably done permanent damage to the way my eyebrows will grow in for the rest of my life. I will continue to look longingly at my friends who have perfectly full, Jennifer Connelly-style brows and envy them for their teenage foresight in not messing with them. There continues to be a gap between how I see myself and how I live my life. When I think of my aspirations to be a world-traveler, and then look at the reality of how infrequently I’m on a plane these days, I have to reckon with where I’m leading myself astray. Is the miscalculation in the dream, or in the reality? The same goes for my physical presentation. If I have the desire to look a different way, yet achieve the effect only haphazardly, is the failing in my effort or in my attempt to effect the change in the first place? But rather than stay wedded to these black-and-white distinctions, I’m trying to find a way to blend them a little more seamlessly, to approve of where I am right now so that I’m not shocked when I arrive somewhere else in the future and haven’t become a different person entirely.